“The most weird, wonderful, magical place on earth-there is nothing else like it anywhere." The park is divided into Four Districts: the Island in the Sky, the Needles, the Maze, and the combined rivers—the Green and Colorado—which carved two large canyons into the Colorado Plateau. While these areas share a primitive desert atmosphere, each retains its own individual character. Island in the Sky- Most visited, Easiest to access out of the districts in the park, Just North of Moab, Utah. The Maze- Very hard to get to, its about a 2 hour drive on a bumpy dirt road to get there, 4x4 needed. The Island in the Sky mesa rests on sheer sandstone cliffs over 1,000 feet above the surrounding terrain. Every overlook offers a different perspective on Canyonlands' spectacular landscape. The Island is the easiest district to visit in a short period of time, offering many pullouts with spectacular views along the paved scenic drive. Hiking trails and four-wheel-drive roads access backcountry areas for day or overnight trips. Most of the epic views in this section aren’t more than a half mile from the trail head right off the side of the road. I’d like to make a note that one of my FAVORITE places in this park which was an unmarked trail called False Kiva Cave, is now permanently shut down due to Vandalism this year. (Pictured Below) This pains my soul to hear about people disrespecting such sacred areas and ruining it for everyone else, please always remember to leave no trace, even leave it BETTER than you found it and report anyone you see vandalizing the park. This amazing view was taken away from us this year due to disrespectful people vandalizing this sacred cave! Always leave things better than you found them Please. Short on time? Four short, self-guiding interpretive trails highlight various aspects of the area's deep Southwest culture. Over 60 miles of interconnecting trails present hikers with spectacular canyon scenery. Some of the more common routes are described below. Trails range from slickrock benches and sandy washes, and some may require negotiating steep, rocky passes with drop-offs, narrow areas and ladders. WATER SOURCES are few and far between, show up with the water you need for your trip to avoid having to drive back to the Visitors Center. Roadside Ruin .3 mi/.5 km, 20 minutes Easy trail. Leads to an ancestral Puebloan granary. Cave Spring .6 mi/1 km, 45 minutes Two ladders. Leads to historic cowboy camp and prehistoric pictographs. Pothole Point-(Below)Is best seen after a fresh desert rain storm, is an easy .2 mile walk about with some gorgeous views of the Needles sticking out in the distance. Slickrock Trail 2.4 mi/4 km, 2 hours Uneven surface. Several viewpoints and sometimes bighorn sheep. There are many ways to enjoy Dead Horse Point State Park, one of them is several of the Mt. biking trails around the rim or down into the beautifully carved canyons. 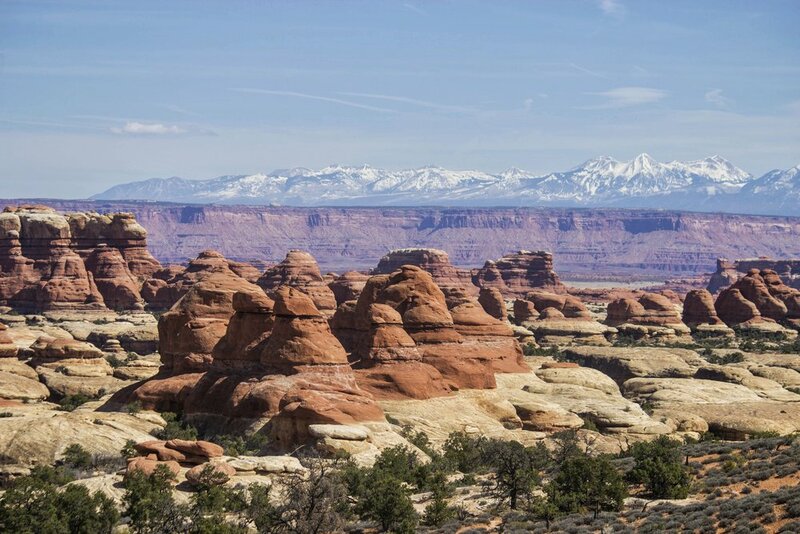 Located on the border of Canyonlands Island in the Sky District, this is a must see while your touring the area. Description: Upheaval Dome Overlook Trail in Canyonlands National Park's Island in the Sky region is an out and back 1-1.5mi. RT moderate hike that leads to an interesting view of a very intriguing rock formation. Description: Grand View is a 2 mile out and back trail located near Moab, Utah that offers scenic views and is good for all skill levels. The trail is primarily used for hiking and is accessible year-round. Description: This strenuous backcountry route follows the washes on either side of Upheaval Dome. Spur trails partway around the loop provide access to the center of the crater (3 mi/4.8 km) and the Green River (7 mi/11.2 km.) Total elevation change is roughly 1,300 feet. The north side of the loop passes through a riparian area where water and shade are usually available. There is one designated campsite along the trail.